rant and entertainment venues, and by partnering with Georgia State University to bring a higher-education anchor to the area; and economically – by cultivating businesses, jobs and community services. With control of over 1,800 feet of street frontage on both sides of Hank Aaron Drive, as well as almost 700 feet of street frontage along Georgia Avenue, the development team, taking cues from iconic commercial districts like Los Angeles’ Abbott Kinney Boulevard, Miami’s Lincoln Road and Austin’s South Congress, intends to create a walkable streetscape that is quintessentially Atlanta. The redevelopment of Georgia Avenue, with design led by Kronberg Wall architects, is expected to open in late 2018. The scope includes the restoration of eight existing street-front buildings and the addition of three contextual vernacular buildings linked by tree-lined sidewalks and outdoor patio spaces connecting the Turner Field redevelopment to the historic Grant Park neighborhood. The combination of the new and existing streetfront commercial buildings will create the type of public gathering place rarely found in Atlanta. Georgia Avenue will be an interlocked web of human-scale streets with garden courtyards, street-front cafes, art installations, offices and nightlife with urban residences integrated throughout. Atlanta’s historic intown neighborhoods, with their proximity to culture, parks, transit and jobs, are experiencing a tidal rebirth. Serviced by two interstates and only eight minutes from the world’s busiest airport, Summerhill is positioned to evolve into the gathering place that merges these historic neighborhoods with downtown Atlanta’s vibrant business and tourist core. Building Atlanta Together You might say that we were built for each other. ConstructConnect is proud to support the AIAâ&#x20AC;&#x2122;s aims and objectives, achieving this through financial support, educational resources, and tools. In this spirit of collaboration, we ask in turn that you share your project information with us. More accurate data benefits our entire industry. We get things done better, together. To learn more about ConstructConnect, visit ConstructConnect.com . William de St. Aubin, AIA Bill de St. Aubin, CEO of Sizemore Group, provides expertise on town planning and architecture. He is a founding board member of the Atlanta Chapter of the Congress for New Urbanism and a subject matter expert for the United States Green Building Council. Bill has published several papers, conducted seminars and received design awards for his work in transforming communities and sites into vibrant town centers. Michael Kahn, AIA Michael Kahn is an architect, lecturer and journalist. In practice at Rosser International, he also serves as the architectural contributor for ArtsATL, associate editor of Curbed Atlanta and is a regular contributor to “City Lights” with Lois Reitzes on WABE 90.1. Academically, Kahn writes and lectures on issues at the confluence of urban planning and architectural history, both locally and internationally. Shaun Martin is a registered architect with a passion for design, art and education. She serves on the Advisory Board for KSU's Zuckerman Museum of Art and holds several leadership roles with the Smyrna Arts and Cultural Council. She is currently employed by the Metropolitan Atlanta Rapid Transit Authority, working on transit-related projects. Paul Monardo, AIA Paul Monardo, AIA, has 34 years of design-focused practice experience. His previous role at Pond as Director of Architecture ensured that each project achieved the highest level of design and technical quality possible. Though Paul’s experience spans commercial office, corporate, retail and industrial project types, his passion for architecture and planning are firmly rooted in government services and the public design process. Ganesh Nayak, AIA Ganesh Nayak, AIA, is a principal at Metier Consulting Inc, in Atlanta, consulting on sustainable design. An architect with over 20 years of experience in many project types, and quality control in construction, he won a Corps of Engineers award for excellence. He has a master’s degree from Kansas State University. He presently serves on the State Advisory Panel for Special Education in Georgia. Design in Practice Editor's Note Design is the tool that shapes how we experience the world. As politics shift, technology evolves, the climate changes and our population grows, design must anticipate and respond. Many people ponder what architecture is and why architects are important. The “Design in Practice” issue explores the questions non-architects have about the profession, and discusses the many roles architects play in the design of our homes, offices and stores, and in public health. First, we provide insight into the future of the organization. Among numerous changes, we are excited about relocating to the Hurt Building, a downtown landmark built in 1912. We are leaving a space at the neighboring Robert W. Woodruff Volunteer Center following its unforeseen sale. We also reflect on our initiatives. Now in its thirteenth year, the High School Design Competition continued to challenge and engage young minds in the design process. The annual Vision for Atlanta forum, headlined by Atlanta’s mayoral candidates, helped residents learn about their visions for economic growth, historic preservation, zoning and safety. Finally, in the fall, we launched Open House Atlanta, our largest program to date. The two-day festival invited the public inside dozens of landmark buildings for free tours, attracting thousands of visitors. 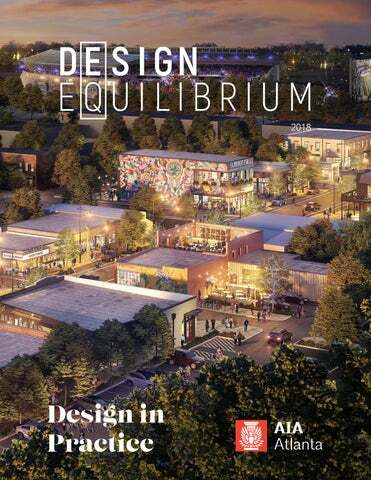 Through Design Equilibrium, AIA Atlanta aims to contribute to a growing discussion of the built environment and educate about design's effects on how we work, live and play. Great design is more than pretty buildings; it creates solutions, strengthens community and inspires lives. Malachi Gordon Malachi Gordon is a designer and strategist, currently serving as Director of Branding & Communications at AIA Atlanta. He is also owner of branding agency Gordon Media Company, working with entrepreneurs and small businesses around the world. Malachi's expertise includes brand identity, graphic design, strategic communications and content marketing. our work with honesty and integrity. An architect’s work is difficult and risky, and requires robust business and management skills to be successful. Through media partnerships, events like Open House Atlanta and collaborations with civic, arts and educational groups, we will continue to build public awareness for the chapter and the profession. Design matters! Architects have heard this stated and have communicated this to others over the course of their careers. It is true! Design excellence elevates the human spirit; touches the emotions and senses of all who experience it; and provides joy, comfort and awe to those within these environments. Let's celebrate great design and honor those who are committed to producing it. Architects are some of the most innovative problem solvers in the world. Architects approach problems with creative energy and we are trained to provide not one but a wide range of solutions to resolve complex issues and problems. In a time when communities around us are in great need of new ideas and the support of others, let's reach out to them, get involved and contribute our creative skills to meaningful community solutions. AIA Atlanta can do this by promoting leadership and engagement in our communities, and by being a strong voice for the profession and affiliated members. The world is changing and the profession needs to change and adapt, too. Technology advances, the evolution of design processes and shifting demographics are just a few changes that will shape the future of profession in the decades to come. Additionally, equity, diversity and inclusion are top priorities within the profession and AIA Atlanta will be an advocate for these goals. The success of our profession, practices and chapter depends on achieving them. It is my honor to serve as your 2018 president and I look forward to a productive and effective year. From left: Bill Clark, Karen Jenkins, Richard Kramer, Katie Yielding-Hughes, Ian Hunter, Desmond Johnson, Michael Kahn, Jessika Nelson, Brandon Chambers, Aaron Albrecht, Chris Welty and Greg Mullin. Not pictured: Ryan Cavanaugh, Krista Dumkrieger, Tim Keane, Joanna Robinson and Robert Woodhurst. Meeting code is only the beginning. A single fire-rated OSB panel that gives you what you need to help you design what you want. Do more than you have ever thought you could with LP® FlameBlock® Fire-Rated OSB Sheathing. It’s engineered to meet fire codes, offers an Exposure 1 classification, and with a thinner panel it can deliver the same structural strength as FRT. Plus, it eliminates the need for an extra layer of gypsum as compared to common wall assemblies. It’s a proven product that saves you money in the long run and gives you greater design freedom—all in a single panel. © 2018 Louisiana-Pacific Corporation. All rights reserved. All trademarks are owned by Louisiana-Pacific Corporation. AIA Atlanta Office Relocation BY HOUSER WALKER ARCHITECTURE Last September, less than four years after relocating its offices to the Woodruff Volunteer Center in Downtown Atlanta, AIA Atlanta, with AIA Georgia, was uprooted once again due to the sale of the building. After several months of searching for a new home, a committee decided on the historic Hurt Building just steps away from the former offices. Atlanta-based firm Houser Walker Architecture was selected to design the project, with completion slated for spring 2018.
experiences that balances the need for staff to work effectively on a daily basis, while welcoming members and the public at large. A flexible gallery space at the entry and large, flexible meeting spaces allow for a variety of programs and exhibits to be hosted. A more private work suite allows the staff to participate when needed but remain focused while other activities take place. We believe that architecture expresses its clearest power through a heightened material quality and presence. of exhibitors from more than 40 countries. Connect at the largest, most inspiring tile & stone show in North America. Connect at Coverings. Founded in London, in 1992, Open House is a worldwide movement dedicated to engaging the public in a cityâ&#x20AC;&#x2122;s architectural legacy. Open House Atlanta, launched in collaboration with Midtown Alliance and Central Atlanta Progress, aims to promote a greater appreciation of the built environment through free access to architecturally and culturally significant sites seldom open to the public. Buildings include museums, high-rises, churches, hotels, offices and more. Atlanta, joining New York City, Chicago and San Diego, is the fourth Open House city in the United States, with more than 30 worldwide. Open House Atlanta provides visitors a better understanding of how the built environment sustains this bustling town as a unique place to work and play. It also allows attendees to meet some of the people who design, build and preserve the city. Coinciding with the festival, the Linger Longer program offered visitors exclusive food and drink specials at select restaurants, further engaging the local community. The festival will return for a second year in October 2018. YOUR BIGGEST OVERHEAD COULD BE YOUR OVERHEADS. YOUR CLIENTS WILL SAVE EVERY TIME THE LIGHTS GO ON. Georgia Power’s Commercial Energy Efficiency program allows you to design in big energy savings. With rebates for highefficiency lighting, heating and cooling, water heating and food equipment, your clients can spend less on energy from day one. For details, visit georgiapower.com/commercialsavings or call 1-877-310-5607. ©2018 Georgia Power. All rights reserved. Engineered to Move with You Create the perfect combination of intelligent technology, functionality and design with functional hardware by Hettich. Since 1888. Held in 2017 at Summerour Studio, AIA Atlantaâ&#x20AC;&#x2122;s annual award ceremony celebrated the Honor Awards and the Residential Design Awards. Sonia Miller, integration project manager at NASA, joined as guest speaker. The late John Portman, Jr., FAIA was honored with the Presidential Citation. The iconic architect passed away on December 29, 2017. JAY SILVERMAN, AIA The most prestigious prize bestowed by AIA Atlanta, the Ivan Allen Sr. Trophy is given to the member who has exemplified a broad commitment to their professionâ&#x20AC;&#x2122;s community with a deep and lasting impact on their peers, AIA and the built environment, and therefore sustained the highest ideals of the profession of architecture. ROBERT M. CAIN, ARCHITECT The Silver Medal is the highest honor bestowed by AIA Atlanta upon an architecture firm. The award honors a firm that has sustained outstanding performance as evidenced by a consistently high level of design quality and demonstrated community, political or AIA leadership in the interests of the profession. Dorothy Spence Citizen Architect Award KEVIN CANTLEY, AIA The Dorothy Spence Citizen Architect Award honors a member who, outside of AIA, engages in their community with a design mentality. They break down silos, see how various community problems are interconnected and leverage solutions. Tiny House Atlanta Executive Director Will Johnston (center) is awarded the Kwanza Hall Award by 2016 president William Carpenter (left) and Councilman Kwanza Hall (right). Robert M. Cain, Architect receives the Silver Medal Award. John A. Busby Jr. Award NICOLE SEEKELY, AIA The John A. Busby Jr. Award is given to a young member who has excelled in leadership, community involvement, success in the firm management and/or started their own firm. James G. Fausett Service to the Profession Award ERIC ANDERSON, AIA The James G. Fausett Service to the Profession Award spotlights a firm, group or individual for outstanding service to AIA and/ or profession at large. Kwanza Hall Award WILL JOHNSTON Named after Councilman Hall, this award recognizes the leadership of a non-architect who has pushed members of the design community to elevate the quality of our work to improve the livability of our towns, cities and neighborhoods. The 4th Annual Residential Design Awards honored excellence in work built by AIA Atlanta members and architects registered in the state of Georgia. A jury deliberated on the criteria of innovative approaches to materiality, incorporation of natural lighting in design, use of new structural systems, design to accommodate a wider variety of lifestyles and adaptable design that acknowledges aging and changing physical needs. Jurors included architects Maria Casarella, AIA; Carlos JimĂŠnez; Marieanne KhouryVogt; Eric Osth, AIA; and Erik Vogt. Broadstone Midtown is sited on the corner of Juniper and 6th streets in Atlantaâ&#x20AC;&#x2122;s Midtown neighborhood. Its 218 luxury apartments are within walking distance to a large job base, restaurants, bars, churches, Piedmont Park and entertainment such as The Fox Theatre. One- and two-bedroom apartments are available with a variety of floor layouts. Live/work units are incorporated at the street level to connect the project to the city and bring activity to the sidewalks. Residential amenities include a fitness center, large bike storage and repair facility, dog grooming room, fenced dog park, club room and several terraces overlooking Midtown. Patterns were painted over the stucco exterior at several locations to provide a glimpse of the buildings eclectic interiors and connect the building to Midtownâ&#x20AC;&#x2122;s vibrant community and public art displays. The project received the NGBS (National Green Building Standard) Bronze Certification. Throughout the building and in each residential unit there are sustainable features, including energy smart appliances, low flow plumbing fixtures, programmable thermostats and energy efficient lighting. The design of the Inchyra House represents a return to family roots for the owners, one of whom grew up near the beautiful north Georgia property. Their interest in a sustainable lifestyle, organic gardening, viticulture, aquaculture and sustainable land use completely inform the design solution. The open site was formerly agricultural land, the context is rural and primarily farmland. The master plan of the 10-acre site includes locations of the main house, guest house, greenhouse, a pond for viticulture, orchards, crops, gardens, a labyrinth, privacy screenings of native plants, paths and gravel roads linking the various site functions. Southern views toward the mountains of the Chattahoochee National Forest were paramount in location and design of the house. The one-room-wide shotgun design of the house combines southern vernacular concepts of cross ventilation and livability. A traditional dogtrot transects the middle of the house as main entry on one side and open patio living on the other. The open east wing of the house comprises the day-to-day living areas while the west wing houses guest quarters, laundry, shop, gym and mud room functions. The house is a study in energy conservation, economy of materials and minimalist design. The eastâ&#x20AC;&#x201C;west linear orientation is ideal for the southern climate. Extensive eaves shelter south-facing glazing in summer and allow winter sun to warm the floors. North facing walls of insulated concrete masonry units utilize thermal mass to retain investments in heating and cooling, and provide a sound and privacy barrier toward the adjacent highway. forms that orient the spaces to the site and define the see-through entry. The second floor’s master bedroom and office are contained in a third L-shaped enclosure that sits atop the lower floor enclosures and spans the central entry. An open, cantilevered stair extends the entry to the upper floor and metal roof “hats” define the ground floor volumes from above. for daily use; a family kitchen and casual dining area supported by a commercial-grade chef’s kitchen and pantry. Upstairs is the master suite, complete with a dressing room, sitting room, his/her offices and a private rooftop terrace. The opposite wing contains multiple guest suites. The lower level houses a viewing room, wine cellar, game room, gym and sauna. Adjacent to the home’s public arrival court, a porte-cochère leads to a private auto court and carriage house. Hidden just beyond, an outdoor pool and spa are cradled between lush landscaping, a shade trellis, and an open-air pool house. A sport court is cleverly concealed behind a landscape screen. notable aspect is that it exists at all amid the pseudo-Tudors, period bungalows and new builder-spec foursquares that characterize the pricey in-town location. Would that all of Atlanta’s new modern work were as skillfully done as Bob's." Renovations/ Adaptive Reuse: Greater Than 5,000 ft2 The adaptive reuse of Page Woodson School into affordable apartments marks a vibrant cultural rebirth in Oklahoma City. This historic African-American high school is an outstanding example of a Classical Revival red brick school building. Part of a larger plan to preserve black history while re-energizing an urban milieu, this project utilized LIHTC funding and historic tax credits to create a 100 percent affordable development. The original building was constructed in 1910; additions followed in 1919, 1934 and 1948. In 1934, it transitioned from an all-white elementary school to the already well-established Frederick Douglass, the city’s only African-American high school and a gathering place for the African-American community in OKC. Vacant for 20 years, the building attracted trespassers who set multiple fires. It was in an advanced state of decay when purchased in 2013. Conceptually, the project addresses the demand for affordable housing while preserving, restoring and adapting a National Register property. Extensive community outreach helped determine the best path for this treasured community resource. An additional story was added inside the gymnasium to optimize living space. The alma mater of author Ralph Ellison, the transformed school still bears Frederick Douglass’ name but now accommodates 65 apartments and a renovated 700-seat auditorium for community arts and performance groups. The adaptation capitalizes on the building’s art deco flourishes, limestone accents and school themes, with most original blackboards preserved in place. A portion of the apartments are scaled as lofts with soaring ceilings, and all living spaces feature abundant daylight. Lizzie Chapel Flats, a circa-1930 building, has been listed on the National Register of Historic Places since 1973 and was recognized as a contributing building within the locally designated Inman Park Historic District in 2002. Formerly a Baptist church, there were multiple failed reuse attempts. The successful design is one that preserved the historic essence of the building and responded to the community’s concerns to maintain limited impact on the character of the neighborhood. The well-received design maintained the appeal of Inman Park by restoring the original historic facades, preserving the Euclid Avenue entrance beneath the original columns, and leaving the church sign in place. The church’s two stories are now comprised of three stories and six residential flats. Each flat is unique due to its location in the church and the historical details that were restored. The stained glass, along with the steeple, were ornamental additions made in the 1970s–1980s and therefore were removed. The tall windows were returned to their original design with window profiles that matched existing. The windows flood the open, loft-like units with natural light. The exterior restoration and interior renovation had to be addressed in an in-depth yet restrained manner. The challenge was to design an evolved space that wasn’t overdone. Over-designing the building would have lost character of the place – but, meticulous detailing and careful collaboration with the engineers was required to achieve 17,000 square feet of residential space. Architects have a tremendous impact on communities, particularly when it comes to the preservation of historical structures. One example is John Carlsten, who discovered the impending demolition of the Eiseman building while preparing an architectural guide for the 1975 AIA Convention. The building was to be razed for the construction of the MARTA Five Points station. Now, over 40 years later, a portion of the old Eiseman building faĂ§ade still hangs prominently as public art inside the station. In this example, history brings ambience and appreciation of the past to a public setting. This inspirational factoid is a profound example of the impact architects can have on the past, present and future. One of the reasons architects feel compelled to "save"
Shaun Martin presenting the arts component at the opening ceremony. Dr. Marchione leading the tour at the opening ceremony. View of the educational wing's angled hallway, showing the aviation-inspired ceiling panels as well as the custom artwork (by Michael Reese) of African-American aviation heroes. Windows on the left provide daylight as well as views of the artwork from the street, day and night. PHOTOGRAPHS BY JIM ROOF CREATIVE, INC.
A view of the rotating art gallery which serves as flexible exhibit space. The other gallery in the facility features a more permanent exhibit of the history of aviation and African-Americans in aviation. African-American contributions. Community: Provides a large multi-purpose room for civic meetings and special events plus a green space for outdoor activities and children’s play area. Our job as architects is to figure out a way to translate human goals and aspirations into the built environment. View of the multipurpose room in a large group performance set up, which can also accommodate lectures and other events. The black curtain system on all sides of the room create a 'black box' environment for dance and theater performances. The world is changing. And so are we. You’ve always known us as ROXUL, the company behind high-quality stone wool insulation. But in a time when the potential energy savings of buildings has yet to be reached, how can we simply sit back? We can’t. United under one global name, we can innovate, explore and develop new ways to do more for our customers and our planet. We are the leader in stone wool insulation. We are ROCKWOOL. Engineered with pure quartz crystals, beaming with diamond-like radiance, Corian® Quartz is visually striking and utterly unique. View of the art instructional classroom serving children from the surrounding communities; other flexible classrooms address programs related to dance, career training, media/computer sciences, and aviation training. Pictured above: View of a community tour of the facility with the building's red bolt, which represents African-Americans in flight, in history and in the future. The red panels in the background serve as surfaces for applied signage advertising performances and events at the facility to the community. While most workers find job stability and set employee benefits ideal, a growing number are becoming independent contractors in favor of working nine-to-fives. Greater flexibility, according to studies, does improve happiness and productivity after all. Companies also benefit from independent contractors, relying on shortterm help and outside expertise at a fraction of the cost of hiring an employee. However, there are companies that treat independent contractors as though they are employees, which puts the business in legal jeopardy. care of employees' income tax withholdings. Drawbacks to being an employee may include an inflexible schedule, having to commute to an office and supervisors dictating your daily work. Independent contractors set their own schedules, but with additional flexibility comes more risk and responsibility. Although able to self-govern work, this may coincide with working longer hours to find clients. Many independent contractors also spend a fair amount of time invoicing clients and awaiting payment. Furthermore, those who are self-employed bear the full employment tax burden, the responsibility of withholding income tax and costs of health insurance. These additional responsibilities may be justifiable costs for freedoms like working with multiple=clients at once, flexible hours and being able to work remotely. If it is determined that an employee is misclassified as an independent contractor, a company can face a number of penalties by both the U.S. Department of Labor and the IRS, including being required to pay fines, back-taxes and interest on wages. Also, misclassified workers may be able to claim employee benefits retroactively. (Some businesses qualify for relief from federal employment tax with reasonable basis defined under the IRS' Section 530.) Many class action lawsuits have materialized due to the mislabeling of independent contractors, resulting in multimillion-dollar settlements from companies like DoorDash and FedEx. worker can be costly legal mistake, whether committed knowingly or unknowingly. As an independent contractor, the worker must fight to protect his or her independence, and thus the ability to thrive as self-employed. Many businesses seek to protect their own interests first, so know your rights and be your own advocate. For more information on the rights of independent contractors and employees, visit irs.gov. ■ The information presented in this article is for general guidance on matters of interest. The application and impact of laws can vary widely based on the specific facts involved. This article is not to be considered legal advice and should not be used as a substitute for consultation with an attorney. GILBANE HAS THE EXPERIENCED TEAM TO HELP BUILD YOUR VISION RIGHT HERE IN ATLANTA. Through our in-depth industry knowledge and innovative approach, Gilbane continues to successfully deliver projects with a focus on mixed-use, multi-unit residential, high-rise, healthcare and education markets. Architects outside their environs elicit a ‘wow’ factor from the general public when they identify themselves as one. This reaction is perhaps reserved for anyone from the creative class, which architects in public perception certainly are. Behind the ‘wow’ is intrigue and probably a cloud of incomprehension about the profession. It is this cloud that, while elevating us as a profession among others such as finance, media, law, etc., forms a distance in perception and relegates us from the forefront in decision-making regarding design and the built environment. It is this cloud that we need to lift. So, what do architects do and why should we matter? There are any number of significant responses to this query, and I will attempt to frame one around three points and lay out the fourth one that indicates the potential of what we can do. This is one concept that has gained currency in the past decade. Tim Brown of Ideo, a global design company, defines it as a human-centered approach to innovation that was originally developed in the business world to create products, services, processes and even strategy. Thinking design of course is what architects do. One area where they are an integral part of the design thinking team is healthcare, where the concept of ‘empathic design’ is taking hold. Empathy for the user is core to the design of environments, procedures and processes, privileging the patient over patient care teams, and user-based over metric-based design. Apart from providing pleasant environments from colorful interiors and spaces of comfort such as gardens, there are other effects: waiting times become shorter, patient room clusters are designed so nurses can get quicker to the patient; sinks are more visibly located, improving hygiene and reducing chances of infection. Here, design is a direct factor in improved patient outcomes, faster healing and fewer errors. A case in point is the Rotterdam Eye Hospital, which revamped its design by turning the focus on the patient – specifically, their comfort and reducing anxiety – and now reports that patient intakes increased by 47 percent, with significant uptick in patient satisfaction.1 2. REMEDIATION. Architects know how to remedy environments and repair gaps in the urban and rural fabric that are torn by the vagaries of economy and policy. We design safe environments that have the potential to nourish and nurture communities back to states where they can thrive and create opportunities for regrowth. We are among the first responders to an urban crisis. For instance, in Detroit, where entire neighborhoods have been hollowed out by the economy, a neighborhood is being planned with tiny homes ranging from 250 to 400 square feet, which will be rented out at $1 per square foot – a very affordable solution for low-income populations, and a move that restores humanity to the homeless. In Atlanta, Centennial Place, built before the 1996 Olympics, has gone a long way in repairing the fabric that was frayed by urban blight and has since provided safe, affordable places to live. The $20,000 homes designed by Auburn’s Rural Studio are high-performing, well designed solutions to affordability that enable people to live with dignity in their own communities, slowly making them whole again. houses in the Lower 9th Ward are high-design, high-performance structures that are designed to withstand flooding in the future, raised several feet or even a story above grade. The architects learned from the disaster, local environment and practices, and designed houses that meet high sustainability goals and improve survival in the event of a natural disaster. 4. RECONCILIATION. Architects are, by training, problem solvers. We have a unique approach to problem solving in several ways. We are trained to be always aware of the context and keep the hackneyed big picture in view. And we deploy both sides of the brain, arriving at solutions that meld creativity and technique; art and science; and theory and practice. Over the past few decades, the heroic idea of architect as solo creator has matured to more of a facilitator and leader of large teams that work on increasingly complex buildings. It is this strength – the ability to reconcile disparate entities – that, I would suggest, architects need to deploy more and more. We’re more divided as a society and nation than in the past that we can remember. There is a need to empathize with other people’s diverse views and mediate between them, be it in policy making or planning, and recognize challenges that affect us all (such as climate change). stronger inputs into the design and planning process. This inclusive process can generate a higher level of community buy-in that is necessary to see completion. we begin a master plan that undergoes extensive refinements to attract public and private investments. We create an implementation schedule and make a final presentation. Once approved, we offer architecture services to implement and manage the project delivery and design. In all cases, we aim to discover what the community wants, understand the market conditions and understand funding sources available (whether they are public, private or both). We focus where those three elements intersect to create an awesome experience for all involved. and redevelopment of strip centers into mixed-use, urban experiences. Our process demonstrated how a transit oriented mixed-use redevelopment would reinvigorate one under-utilized strip center. Unfortunately, the owner later opted out of redevelopment or sale. The project stalled, however, the seeds were sewn for well-planned future experiential redevelopment in the Cumberland CID. Within five years, the Atlanta Braves bought a nearby parcel and built a new stadium and development, The Battery Atlanta. New 5-DAY QuickShip Program for ARCHITECTURAL Products! WITH STEEL Visit www.aisc.org/ATLsteel We can help! High School Design Competition AIA Atlanta's 12th Annual High School Design Competition (HSDC), presented in partnership with YKK AP America, saw nearly 200 submissions from students representing 30 high schools across Georgia. HSDC's mission is engaging high school students in the design process and educating them about career options in architecture, engineering and construction. The competition features two levels: beginner and advanced, to accommodate students' varying levels of experience. Following the competition, AIA hosted a gallery of all the projects and announced the winners during a special ceremony. First, second and third place winners of the advanced competition received college scholarships. Mayoral Forum Vision for Atlanta is an annual panel discussion with leading experts on design, community planning and real estate development. Moderated in 2017 by journalist Maria Saporta, the forum was headlined by seven of Atlanta's mayoral candidates, including Keisha Lance Bottoms, John Eaves, Kwanza Hall, Ceasar Mitchell, Mary Norwood and Cathy Woolard. The conversation covered design excellence, historic preservation, affordable housing, zoning codes and improvements to the BeltLine. The candidates also discussed their favorite buildings in the city, including existing ones and those that are demolished. On Election Day, Bottoms and Norwood finished first and second, respectively, prompting a runoff since neither candidate secured more than 50 percent of the vote. Bottoms ultimately declared victory with a margin of 832 votes, according to certified results. Bottoms was sworn in as the 60th Mayor of the City of Atlanta on January 2, 2018. 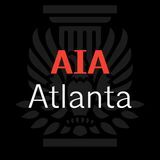 Listen to the podcast recording of Vision for Atlanta 2017 by visiting aiaatl.org/vision-for-atlanta. Eric Balogh, Daniel Dixon, Adam Lamb, Sally Parker, Lauren Sherman and Ryan Woods. Organized by the Young Architects Forum (YAF) of AIA Atlanta, in collaboration with MA! Design is Human, the biennial 10UP Competition invites designers and artists from around the United States to contribute to Atlantaâ&#x20AC;&#x2122;s blossoming arts scene with a design for an original, temporary installation. The winning structure, Midtown ConeCTOR, was temporarily erected for the public to experience, first at Colony Square and later at Ponce City Market. neCTOR IS A SELF-SUPPORTED STRUCTURE THAT CAN SURVIVE THE WEAR AND TEAR OF MIDTOWN. MODULAR IN NATURE, THE STRUCTURE SEMBLED AND DISSASEMBLED FOR RELOCATION AND/OR MODIFICATION. THE INSTALLATION FEATURES A MALLEABLE AND REFLECTIVE CONE H AN INTEGRATED SOLAR LIGHTING SYSTEM THAT ILLUMINATES THE HIGHLY REFLECTIVE BAND ON THE CONE PYLONS. THE ROOF FRAMING REINFORCES THE COLUMNS AND SAFELY CONCEALS THE OVERHEAD SOLAR LIGHTING SYSTEM. 18” WHITE CONES ZIP-TIED TOGETHER CREATE MALUABLE AND DYNAMIC “URBAN FABRIC”. TED IN E WITH N TOP TURE. Midtown leads Atlanta's construction boom with more development activity occurring today that any time in the history of the district, with 37 major development projects currently proposed or under construction. Midtown's skyline, landscape and streets are in a state of perpetual transformation, creating disruption. Midtown Alliance has been the positive force behind this revitalization through longterm planning and 15 miles of streetscape improvements since 2000. Midtown ConeCTOR aspires to augment the way we experience midtown on foot, using the ubiquitous icon of urban transformation as a surprising and evocative design motif. Midtown ConeCTOR is a self-supported structure that can survive the wear and tear of the district. Modular in nature, the structure can be easily assembled and disassembled for relocation and/or modification. The installation features a malleable and reflective cone fabric “skin” with an integrated solar lighting system that illuminates the highly reflective band on the cone pylons. Each bay can be custom adjusted to alter the shape of the cone fabric depending on MATERIAL QTYof theUNIT PRICEThe gravity PRICEheld the length and curvature installation. base and "kit-of-parts" nature allows the structure to be PRESSURE TREATED $ 480.00 LUMBER assembled, adjusted, modified, expanded, disassembled and relocated easily. tall and is constructed out of 1/2 inch birch plywood stacked horizontally supported by 4â&#x20AC;? steel bars. a horizontal cross member provides lateral stability. The overall spacing allows for viewers to move e space between the slices is illuminated with LED lighting. only as horizontal lines lofted on vertical trunks. The duality continues at night as LED lighting illuminates the spaces in-between making voids during the day now becomes solid with light. The installation stands roughly 11 feet tall and is constructed out of half-inch birch plywood stacked horizontally supported by four-inch steel bars. Two vertical walls are connected with a horizontal cross member provides lateral stability. The overall spacing allows for viewers to move between the vertical walls. At night, the space between the slices is illuminated with LED lighting. SAY HELLO TO URBAN SOLUTIONS. © 2018 Kawneer Company, Inc. Spend more time growing your business and less time on accounting matters. become a co-designer of this installation. OSI empowers anyone who wants to write or draw with a piece of chalk. Everyone has a platform. LOOKING FOR MORE VALUE IN ONE POLICY? TALK TO US. XL Catlin’s program for design professionals offers 3 areas of protection: + Professional Errors & Omissions + Privacy/Network Security Liability and Data Breach coverage + Employment Practices Liability PLUS reduce your risk with online education from XL Catlin’s Learning Management System and XL Catlin’s Contract eGuide. What’s more, your firm can earn premium discounts for improved risk management practices. .................................... MORE THAN PAPER. PARTNERS. XL Catlin is the global brand used by XL Group Ltd’s insurance subsidiaries. In the US, the insurance companies of XL Group Ltd are: Catlin Indemnity Company, Catlin Insurance Company, Inc., Catlin Specialty Insurance Company, Greenwich Insurance Company, Indian Harbor Insurance Company, XL Insurance America, Inc., and XL Specialty Insurance Company. Not all of the insurers do business in all jurisdictions nor is coverage available in all jurisdictions. Piedmont Geotechnical Consultants, Inc. • Environmental Phase I Assessments • Asbestos & Lead Base Paint Surveys & Sampling • Hazardous Site Services • Underground Storage Tank Management Services • Geotechnical Evaluations • Site Specific Seismic Studies • Construction Materials Testing Services • Laboratory Services • Structural Steel Evaluation & Testing Services • Welder Certifications • IBC Special Inspection Services • Third Party Inspections • Storm Water Inspection, Monitoring, Sampling & Testing Services Uniting People and Technology...Piedmont Geotechnical Consultants, Inc.
Join the AIA Atlanta Annual Patron Program Increase your company’s visibility, engage AIA Atlanta’s 1,700 members and enjoy exclusive Patron benefits like your ad here. URBANfronts Creative Expressions is a one-night gallery featuring works of art and multicultural entertainment, providing a public forum with the work of local artists and designers. The 2017 exhibition was held in partnership with the City's Atlanta City Studio in the Cascade Heights neighborhood. Renowned architect Oscar Harris served as guest speaker. Creative Expressions coincides with the launch of URBANfronts Storefront Galleries, the temporary adaption of empty retail storefronts with provocative art for a two-week period. AIA Atlanta, in collaboration with ASHRAE Atlanta, ASID Georgia, CSI Atlanta, IIDA Georgia and USGBC Georgia, hosted its annual holiday celebration at the new Mercedes-Benz Stadium. The event offered an exciting evening of networking, small plates, desserts, beverages and a live DJ. Red & Green Scene also served as a fundraiser for Sustainable Design Collaborative Atlanta and a toy drive for Toys for Tots. Principals Roundtable Each month, firm principals and representatives from local AEC companies meet at Principals Roundtable (PRT) to discuss topics relevant to the industry. Meetings include a breakfast buffet, presentation and moderated discussion. Topics include design, best practices, political issues, sustainability and technology. AIA credits are offered for qualifying topics. Programs & Academy of Architecture for Health of Georgia The Academy of Architecture for Health (AAH) addresses unique issues related to improving the quality of healthcare through design. As a forum, it provides the exchange of ideas, concerns, failures, successes and resources to advance the practice of healthcare architecture. Networking and educational events are held periodically to help strengthen the local knowledge base of healthcare design expertise that will ultimately improve healthcare environments within the region and beyond. Spotlight on Atlanta Projects In 2017, the Young Architects Forum of AIA Atlanta launched Spotlight on Atlanta Projects (SOAP), inviting the public to learn about recent and forthcoming developments in the Metro Atlanta. Local firms make presentations and attendees are able to ask questions to gain a better understanding of the built environment. SOAP also provides a unique networking opportunity, with attendees comprising architectural associates, licensed architects and other design professionals. AIA Committee on the Environment (COTE) Committee on the Environment hosts a lunch-and-learn meeting on the second Friday of each month. The one-hour meetings comprise a presentation on various sustainable design topics, including federal regulations, energy efficiency and LEED certifications. Box Lunches AIA Atlanta’s Box Lunch series allows education providers from AEC companies to meet with members and discuss the latest trends in the design and construction. Box Lunches are held monthly throughout Metro Atlanta, including in Midtown, Marietta, Buckhead and in the northeast area. Design for Aging (DFA) Design for Aging was formed to more effectively represent the aging professionals who share common challenges, opportunities and passion for design for aging. As a knowledge community, this group collaborates to deepen its understanding of our aging society through ongoing learning and knowledge sharing. AIAS AIAS, AIA’s student chapters, are active at the campuses of Georgia Institute of Technology and Kennesaw State University. The chapters hold networking events and job fairs throughout the year, and also participate in the Freedom by Design program, leading small projects transforming the lives of disabled members of the community. Volunteer architects are a fundamental part of these projects, helping ensure that they meet health, safety and welfare needs. Discover Architecture Discover Architecture was created by Melody Haclerode, AIA and Phillip Alexander-Cox with a goal of raising awareness of architecture among schoolaged children. The program was inspired by the successful Portland, Oregon-based Architects In Schools, which demonstrated students’ desires for an education in architecture. Discover Architecture is now an after-school program fostering engaging design creativity with classroom and extracurricular activities. Knowledge Communities Procrastination Day To maintain licensure and AIA membership, architects are required to fulfill a number of continuing education credits annually. While AIA Atlanta provides several of these opportunities throughout the year, busy schedules can make it difficult to attend. Procrastination Day is a full-day seminar allowing members to catch up on missing credits with AEC presentations. Open House Atlanta Open House Atlanta is a free architecture festival giving the public an opportunity to explore new and historic architectural landmarks in the city. For just one weekend, attendees are invited behind the scenes of architecture, with exclusive access to sacred spaces, hotels, museums, offices and more – many spaces that seldom open to the public. Open House Atlanta joins more than 30 official Open House cities around the world, including four in the United States. Slate of Ready-to-Assist Architects (SORTAA) AIA Fellows Rocky Rothschild and Cecil Alexander, with Sally Price, hosted the first SORTAA meeting on October 4, 1989, with the goal to gather architectural knowledge from the “old guard” and share these experiences with the emerging generation of practitioners through mentorship. Tour and Sketch Tour and Sketch invites middle and high school students to tour the Zuckerman Museum of Art, being led by volunteer docents and mentor architects. Following, students and volunteers break into small groups to sketch drawings until their satisfaction. Wednesday Night Drafting Club Wednesday Night Drafting Club is a monthly networking event where AEC professionals come together to unwind, connect and reconnect. WNDC travels throughout the city to a different location on the third Wednesday of each month, exploring new restaurants, bars and food trucks. We invite all with an interest in design. Student Mentoring Program The student mentoring program matches students from the Georgia Institute of Technology and Kennesaw State University with design professionals varying in years of experience and areas of expertise. Students meet with mentors to gain insight on the field, attend AIA events together, enjoy office tours, and visit college studios. Students are paired with professionals with similar interests, offering a glimpse of the world beyond graduation and a chance to develop a long-lasting relationship with a fellow practitioner. Tours In an effort to raise public awareness on great design, inform the about the design process and show the value of architects, our tour series invites the community inside of new and redeveloped architectural works in the Atlanta area. Tours are small and intimate, allowing for comfortable viewing. Attendees are also able to ask questions to gain a better understanding of the project. Past tours have included SunTrust Park, Mercedes-Benz Stadium, Don and Mary Ellen Harp Student Center and Commons at Imperial Hotel. Stay Connected Visit aiaatl.org/subscribe to sign up for our e-newsletters and stay up to date with the latest design news and upcoming events.